I can't figure out what I'm not doing or what I'm doing wrong in order to Create Document from a template while using Thunar. Right clicking in the open space doesn't list a Writer template that I've place in ~/Templates or in ~/Templates/Writer. 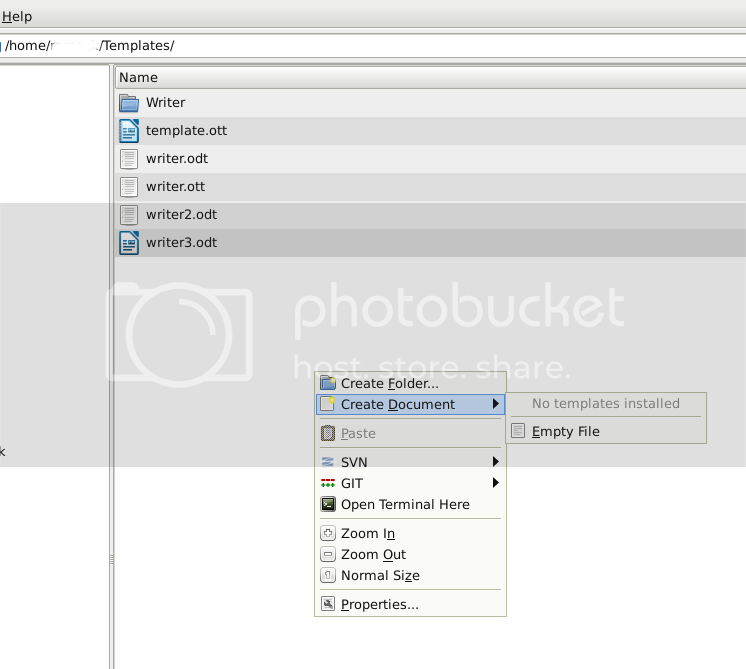 Allows you to create a new document either as a blank file or from a template. If you choose the Empty File option and type in a file name with no extension, by default it will create an empty, plain text document. If you assign a file extension of a recognized MIME type, it will create a file of that type. 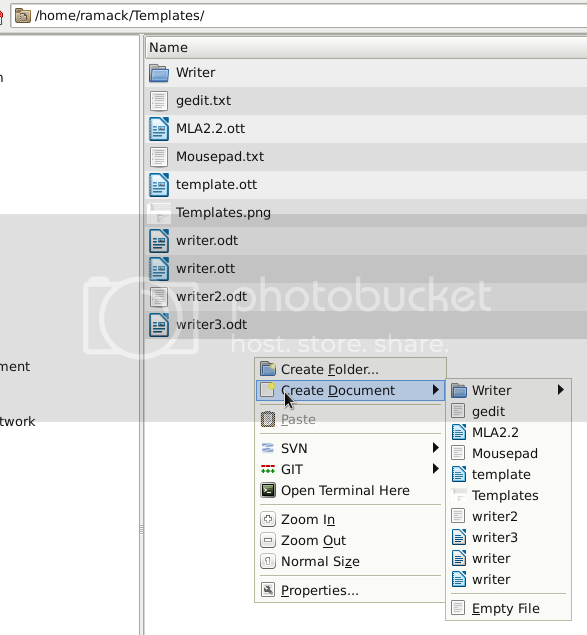 For example, typing MyDocument.odt will create a blank OpenDocument Text file. You can also create files from a pre-configured templates. To do that, you first create a file with all of your desired settings in the application of your choice and then save it in the ~/Templates folder. That file name will then appear as a choice in the Create Document list. Give it a new name and you now have a new file based on your custom settings. I've tried saving the file several different ways, but I'm unable to get anything other than the default Empty File to show. What am I missing? Open Thunar and navigate to your "Documents" folder. Right-click and select "Create Document > Mousepad"
You will be prompted for a name for the file. Enter something else or keep the same. Your call. Open the new file you created, you will see the word "template" in the document. So basically, this allows you to make a copy of an existing document from your Templates folder. Now imagine if you created a libreoffice document to document meeting minutes, where you created the outline/format (plus any specific formatting) for minute-taking but there was no data in it. You can quickly create copies of this "template" document for your minute-taking needs. Following your instructions still only shows the default Empty Text file. What versions of Xfce and thunar are you using? Xfce is a lightweight desktop environment for unix-like operating systems. fast, while conserving system resources. package and the packages it Recommends is a great place to start. Hmmm. I've tried this on a number of computers now and it works on all of them - including my server which runs debian 8.9.
and do the same for the new file you created. The screenshot is from a couple days ago, but show ' No templates installed ' and that the only option available is the Empty file. I didn't cat the output of anything else since I haven't been able to create a file using a template yet. Perhaps you have run into a bug of some sort. Logged out, logged back in and it still didn't show any templates. Not until I rebooted, logged back in did the templates now show. ...to change the xdg directory assignments. Thanks again ToZ, I appreciate it!